Stay at the best located hostel in Galway! Situated in the heart of Galway, across from the legendary Quays pub, and within few steps from host of bars, restaurants and pubs. All rooms are ensuite, and come in range of sizes, from private to 12 bed dorms. Breakfast, linen & Wi-Fi are included free of charge as well. There is a little shop with necessities that’s open 24 hours. 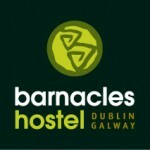 Barnacles Galway has special deals in place with major activity companies and can help you organize karting, kayaking, paddle boarding or other activities in Galway. For rates/bookings and for further info, please use the contact form below.